Regardless of the arena you are writing for, it is generally agreed upon in all academic and sciencific fields that when you borrow someone's work in your own paper, you should credit the work properly to the original author. The MLA format is one of the most popular and simplest forms used to attribute information. This particular style is the one most schools have adopted and accepted. It is also the acceptable format for writing research papers on literature. This format is used by nearly 1,100 scholarly journals, newsletters, and magazines as well. In order to adhere to MLA requirements, you will need to make several tweaks to your initial page setup. Set the top and bottom margins at one inch and the left and right margins at one inch. Make sure that you know the specific requirements of your paper when setting page numbers because sometime a number is not required on the first page. Set line spacing to double space. While MLA formatting is not as strict as some other citation styles, MLA does require that you use a legible font and keep the font a certain size. Before you begin to write your paper, make sure you intend to use a uniform heading plan throughout the whole of your document. If you decide to label the first part of your paper "Heading 1" each subsequent heading must be labeled accordingly in sequential order. All subheadings must also adhere to the same rule. In other words if you want to sub-head heading one like 1.1 and 1.2 and so on, each subsequent heading and subheading must follow the same format. Like all other style formatting guidelines, MLA requires the use of in text citations for work that is paraphrased or quoted within a paper in order to attribute the work. Text citations, or paranthetical citations as they are better known, must be presented in a certain format depending on how the information is used. AuthorName stated the fact that "insert very interesting fact" (202). My paper includes "this very interesting quote" (Author 202). AuthorName extensively explored the concept of this very interesting idea (202). 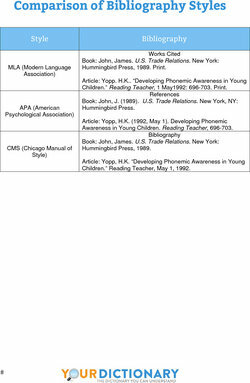 As shown above, each in-text citation must include both the author's name as well as the page number where the information in the sentence can be located. Different rules apply for citing different resources under the MLA. For example, look at some of these examples below to see how the citation and the Works Cited reference should change based on each unique situation. Johnson, FirstName. Name of Book. City: Publisher, Year. Print. "Article on Blue Skys." Name of Magazine. Month, Year. Print. Author, A. Name of Book. City: Publisher, Year. Print. Author, B. Name of Book. City: Publisher, Year. Print. If three or less authors, mention all three in the parenthetical citation. If more that three authors, mention all the first time and for each subsequent appearance use the last name of the first listed author followed by the abbreviation et al. Author, Writer, and Doe argue that this concept is quite interesting (202). The authors state "this concept is quite interesting" (Author, writer, and Doe 76). Author Last Name, Author First Name. Name of Book. City: Publisher, Year. Print. Writer Last Name, Writer First Name. Name of Book. City: Publisher, Year. Print. Doe, Doe's First Name. Name of Book. City: Publisher, Year. Print. The name of the author should be cited in-text if known. If not known, the name of the article can be cited. The easiest way to prepare the ground for planting is to add a rich soil conditioner (AuthorLastName, "Name of Article"). AuthorLastName, AuthorFirstName. "Name of Article," Name of Website. URL. Website. As the final page for your research paper, you will need to create a works cited page. This page should contain all the specific information regarding the whereabouts of the specific information that was cited in parenthetical citations throughout your paper. All citations should be left justified. The Works Cited page must be listed in alphabetical order and double spaced just the same as the rest of the paper. "MLA Format Examples." YourDictionary, n.d. Web. 23 April 2019. <https://examples.yourdictionary.com/mla-format-examples.html>. Regardless of the arena you are writing for, it is generally agreed upon in all academic and sciencific fields that when you borrow someone’s work in your own paper, you should credit the work properly to the original author.